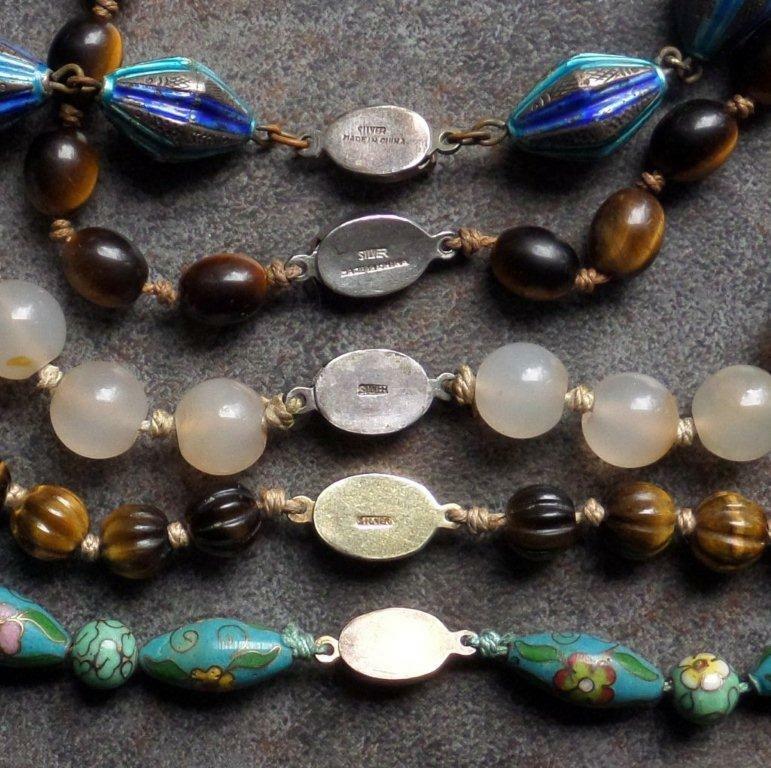 Auction listings for Chinese cloisonne bead necklaces often attribute a Deco Era (c1920-1940) origin for them. But are they really from before World War II, or after? 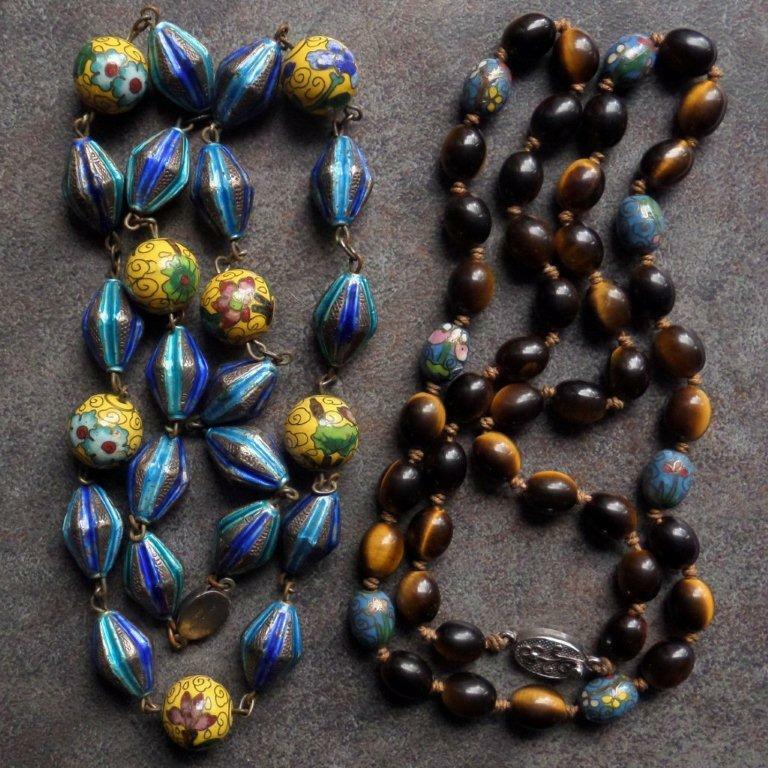 My first blog post was about twisted wire cloisonne beads, featuring what seems very likely to be an actual intact necklace from the 1930s. The clasp is ornate white metal filigree featuring the squirrel-and-grapes motif. The “CHINA” stamp is in serif letters. You can see it at Sue Morton’s Rubylane shop. 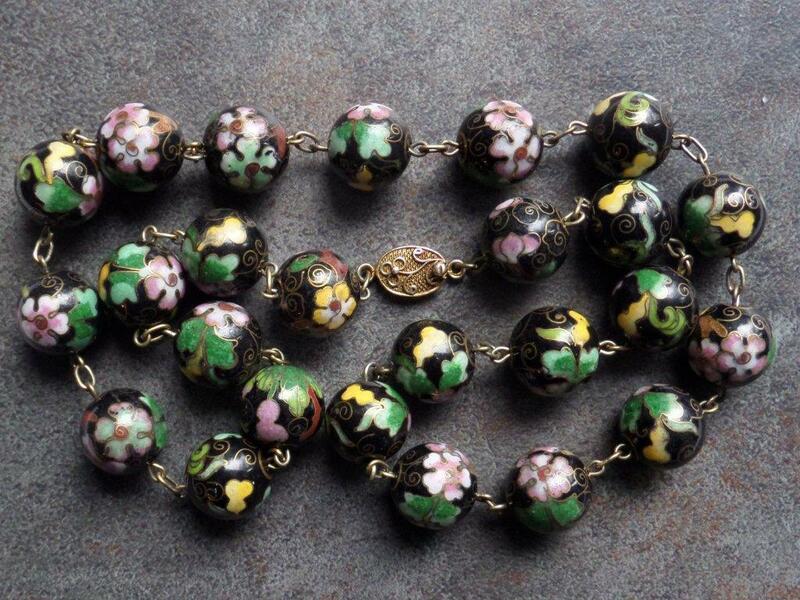 Twisted wire cloisonne beads were used in Mandarin court necklaces. 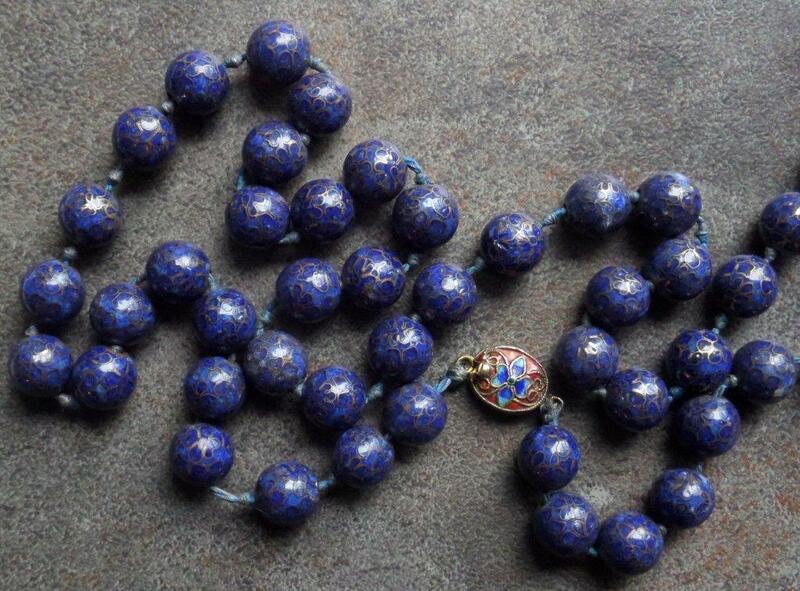 Are these older beads made in that style by craftsmen surviving past the end of the Qing dynasty in 1911? Larry Paul’s book, Made in the Twentieth Century: A Guide to Contemporary Collectibles (searchable online via Google Books) attempts to hack a path through the jungle of things to consider when trying to discover what got made where and when. Note that the information concerns shipments of goods legally imported into the United States, not individual purchases abroad by tourists and travelers. At the end of this post readers can wade through other internet information I found on this topic, but Paul’s book summarizes the basic timeline. Trying to sort the production date of these cloisonne necklaces by means of the stamps on the filigree box clasps seems to be an uncertain effort; that said, the stamped clasps do often appear on necklaces composed of good quality cloisonne and well-matched and graduated stone beads (an important feature, I think, as factory mass production of stone beads in post-1970 decades was largely restricted to calibrated round sizes – 4mm, 6mm, 8mm, etc.). 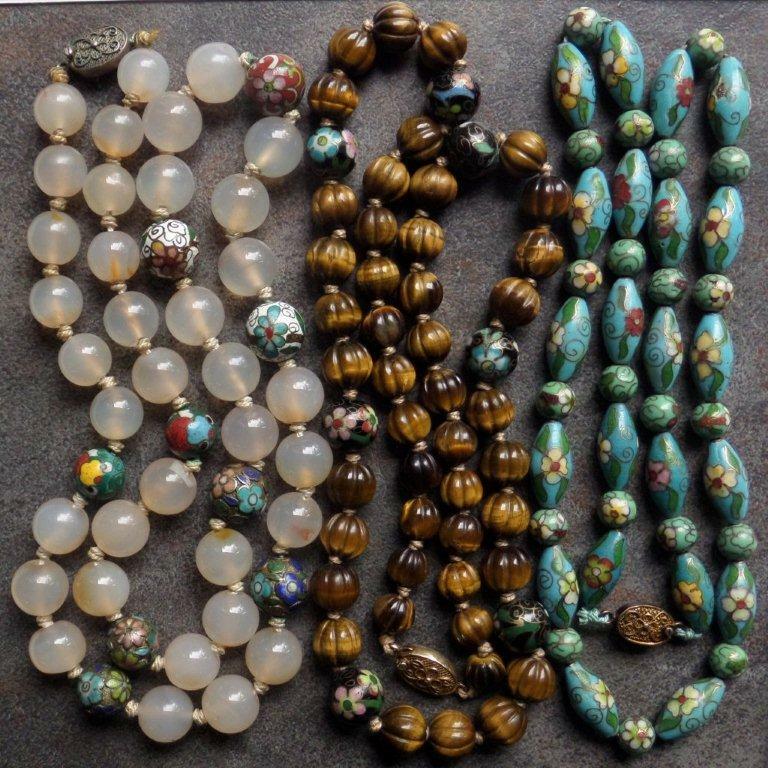 The stones used are what were formerly regarded by the jewelry trade as “semiprecious” – rose quartz, tiger eye, agate, carnelian, lower quality jade. There may be some necklaces out there with amethyst, white or green jade, lapis, or coral – readers, feel free to show us examples. The point is that one doesn’t find the variety of jaspers and other types of rock used in later years. 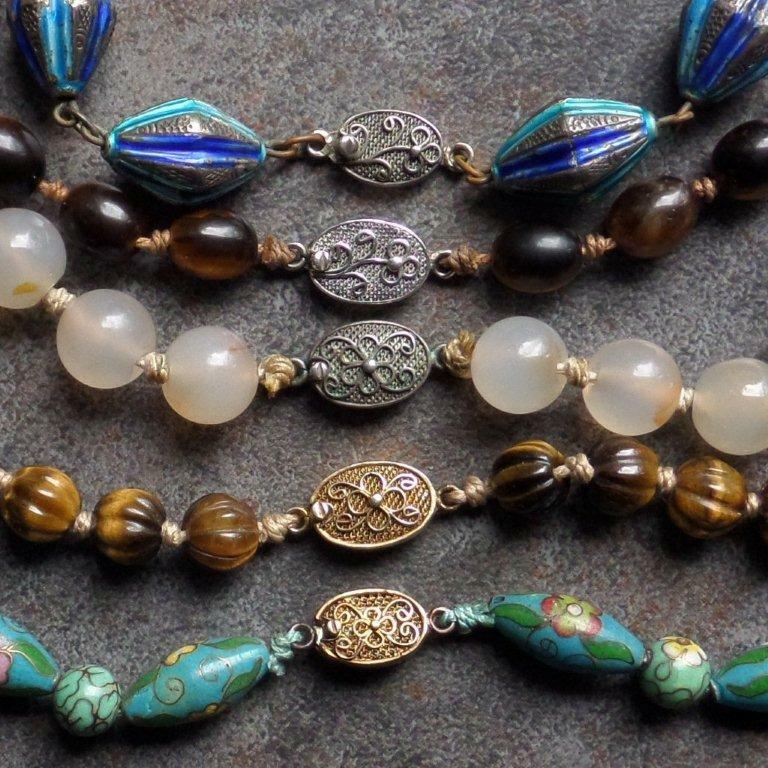 Filigree designs are not the only type of box clasp to appear on the nicer necklaces – some have cloisonné clasps, or enameled silver, or 14K gold (see previous post on agate and carnelian necklaces with cloisonne beads). Filigree clasps stamped "Silver Made in China," "Silver," or blank. Two are gold-washed. Clasps stamped "Silver" on two agate and tigereye necklaces. Blank clasp on right. 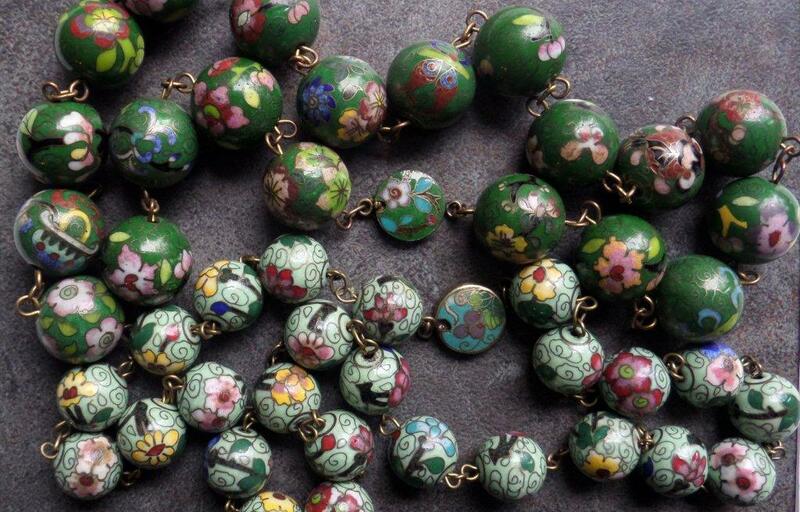 Similar turquoise cloisonne beads appear in a necklace likely to be from the 1960s. Necklaces with a "Silver Made in China" stamp. Gold-washed clasp stamped "Silver Made in China." Notice the "peaked" cloud motifs. Gold-washed clasp stamped "Silver." Note the uniformity of the floral pattern, and the appearance of the JingFa cloud as a background motif. Beads with "peaked" clouds and ornate clasp featuring double fish and the "Shou" longevity motif. 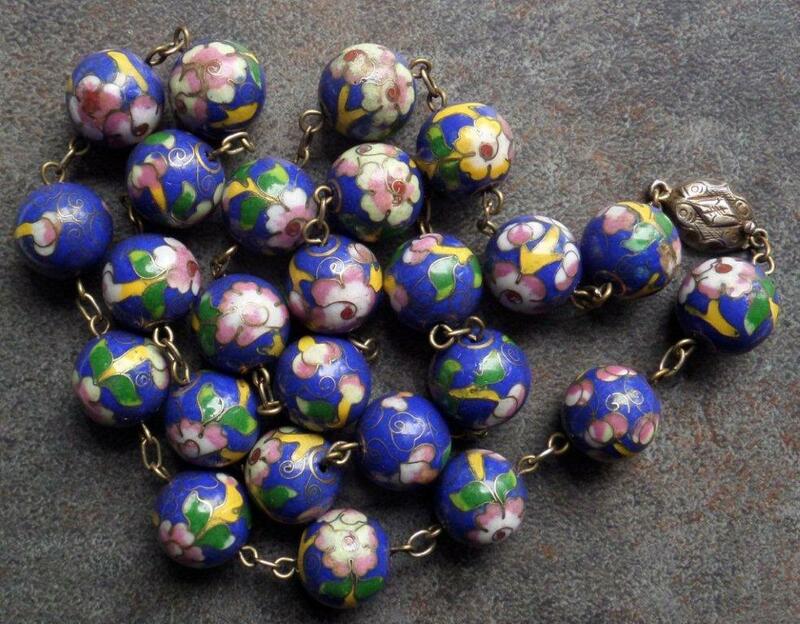 Small 10mm cloisonne box clasps. 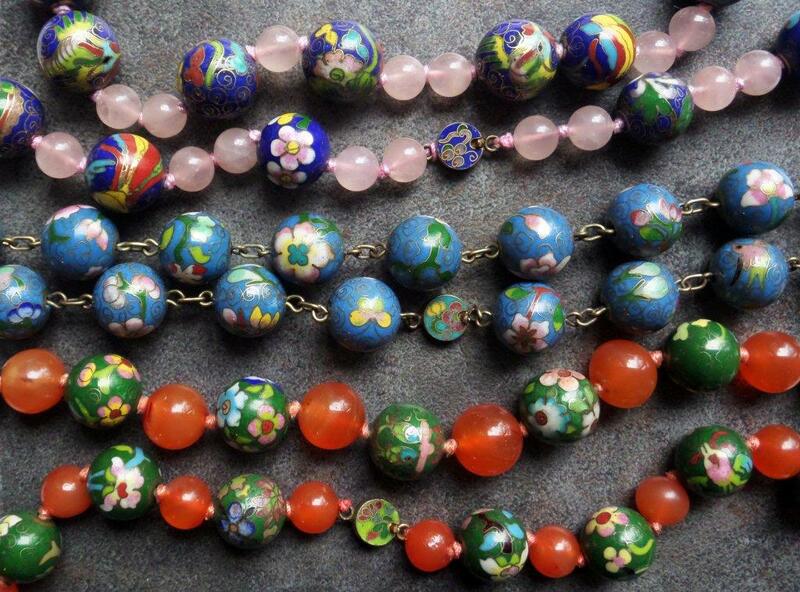 Stone beads are rose quartz and carnelian. Twisted wire cloisonne clasp, not stamped, but appears to be tarnished silver. 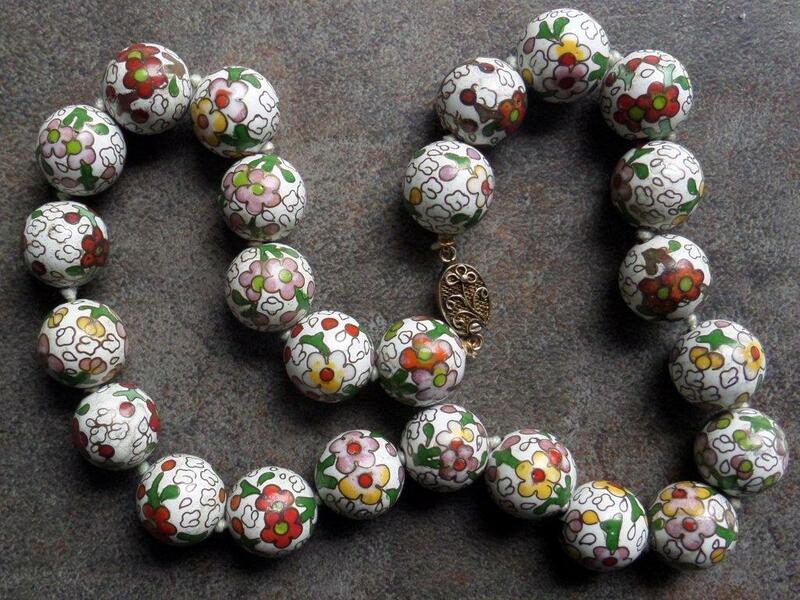 The tigereye melon bead and white and turquoise cloisonne necklaces feature the Jing Fa cloud as a background motif either on a few beads or all of them. The older style of "peaked" or "crinkle" clouds appear as a background motif in the other necklaces. (The JingFa cloisonné cooperative was formed in 1956). 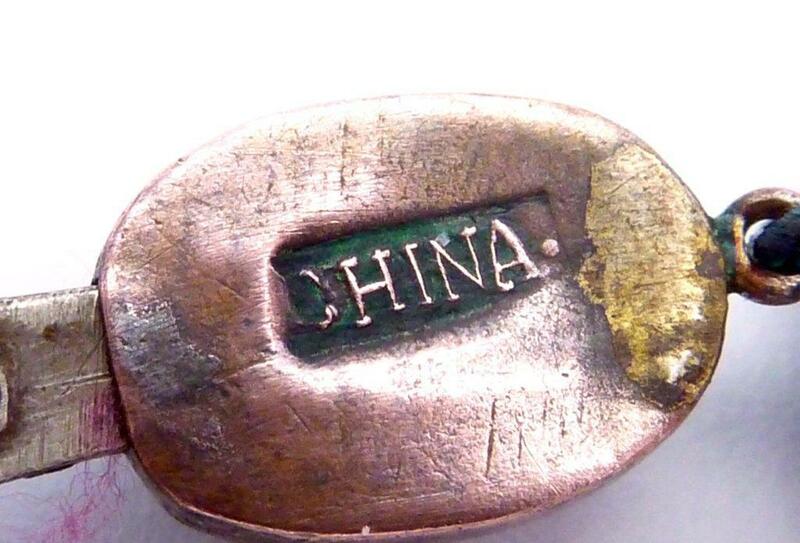 Thus, going by Paul’s information, the “Made in China” stamp was possibly used for about 30 years between 1921 and 1949. The plain “Silver” and “14K” stamps could be post-1950 as well, when an indicator of metal quality was deemed more significant than country of origin, especially for items retailed in Hong Kong. 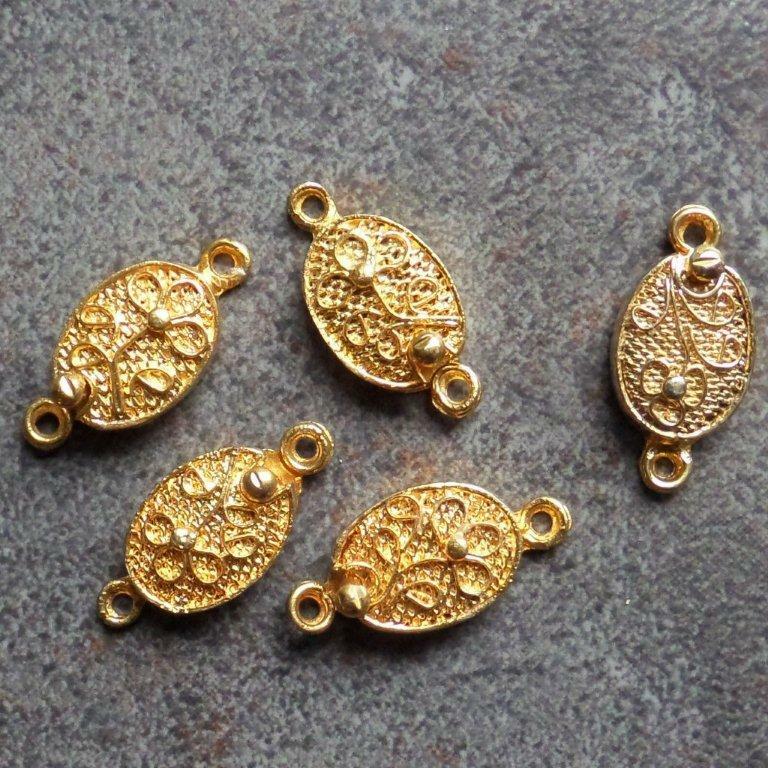 Plated Chinese filigree clasps that I recollect purchasing from Abeada sometime during the 1990s are stamped with a character that I cannot read – Jing? (Those literate in Chinese, please feel free to enlighten us. UPDATE: a beadcollector.net post informs me that this character is indeed Jing) I recollect them being sold as vermeil – gold electroplated over silver. 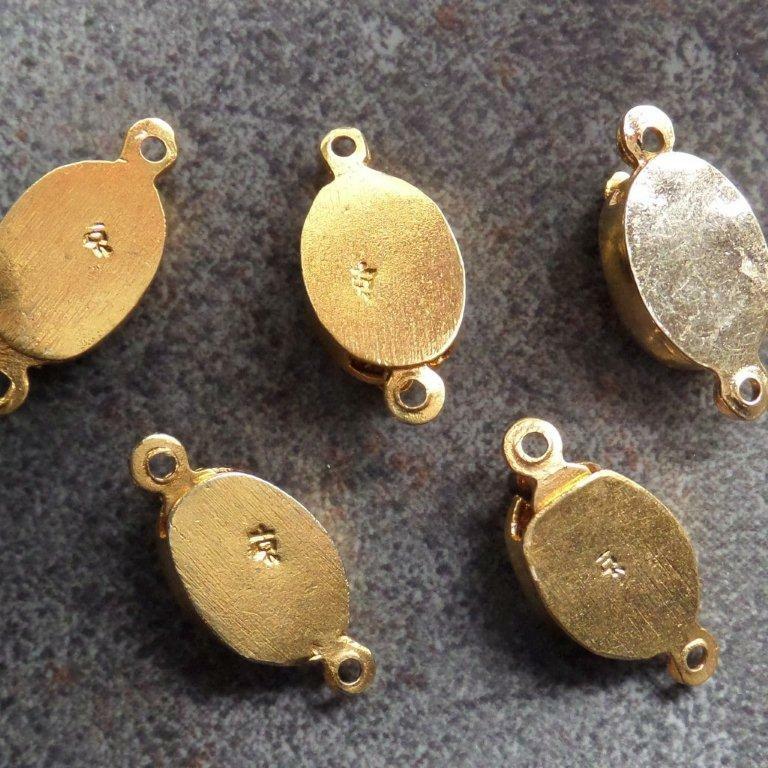 Note the inferior quality compared to the silver clasps featured on the necklaces (compare the finish of the attachment rings, for example). Collectors of porcelain and violins seem to have collected the most readable information on the permutations of country of origin labels and the considerable trickiness of using these labels to date objects. For U.S. imports, the McKinley Tariff Act of 1891 required the country of origin name, then later modifications in 1914 and 1921 required the phrase “Made In” and that the country name appear in English, which requirements were carried over into the infamous Smoot-Hawley Tariff Act of 1930. Again, this was only for goods imported to be re-sold in the U.S., not items purchased by travelers and brought home with them. Another consideration is the U.S. trade embargo of mainland Chinese imports for 21 years, from 1950-1971. Hence it doesn’t seem likely that shipments of articles with a country of origin stamp of “China” would have made it past U.S. Customs during those years; again, this would be for importers, not tourists and other travelers. As to the “Silver” mark, that seems to appear erratically as well. Again, this mark is likely a response to trade requirements for purity designation of precious metals, and could just as easily reflect a British requirement as a U.S. one, especially for items sold in Hong Kong. Compared to precious metal hallmarks composed of fineness and trademark symbols, these clasp stamps seem rather casual.